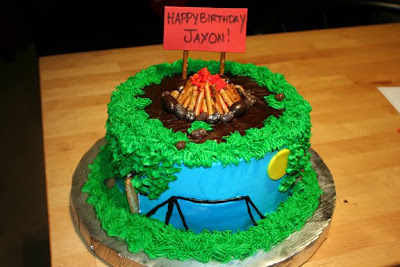 This cake was made for a "camping" birthday! Milk chocolate cake with vanilla buttecream. All details are edible save the sign on top. Pretzel trees, jelly bean rocks, fondant tent. Fun cake to make! I always say that kids cakes are most favorite to do and that is still absolutely true!